The great downsize is proceeding apace and that’s creating these shelves of surplus plants. 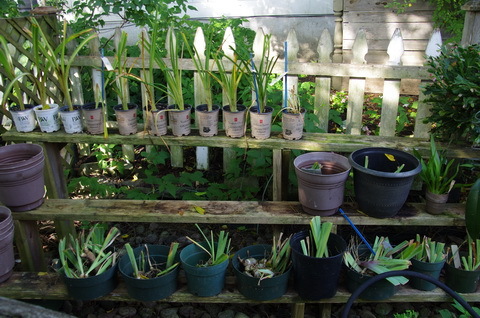 The great plant sale starts this Saturday and will continue next Saturday. The third Saturday is dependent on inventory. I’m digging new inventory every day and each of the Saturdays will have different plants. 9:00 am to noon this Saturday. The address is 111 Trent Street W in Whitby, ON so if you are anywhere near Whitby come on over and see the garden and pick up some bargains. It’s mostly Iris and Daylilies with a sprinkling of other perennials. Look forward to meeting many of you at the sale. I was in Buffalo last week for our annual Garden Writer’s conference and Expo. It’s a great event and time to reconnect with long time associates and friends. 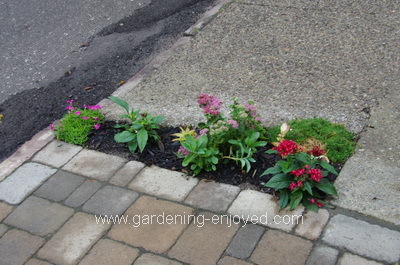 We were in Buffalo the week after Garden Walk Buffalo which is one of the premier garden tour events in North America. We got to see just a sampling of the 400+ homes that are on that tour. It happens the last weekend in July every year and amazingly it’s free. There is a distinct Buffalo style of gardening and it’s making use of every inch of the limited space that most of these downtown homes have. They creatively plant the boulevards between their sidewalks and the actual street. Their front yards will never make a sod farm rich. Most of the side and back yards are a wealth of plants of every size and type. The most obvious thing that all of my garden writer friends noticed is the passion and personality of each garden. 99% of them are completely done by the home owner and not with a cheque book as the primary tool. 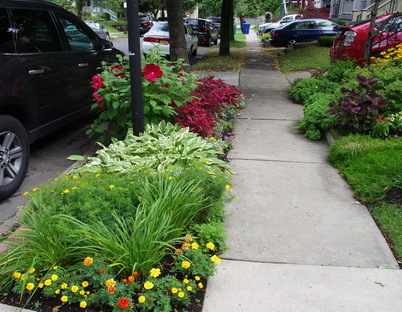 The second picture just seemed to exemplify this use of space where a few small plants are stuffed into a tiny space between the sidewalk, driveway and road. Absolutely delightful. I have many wonderful pictures of the amazing front and back yards but these two just illustrate the maximizing of gardening space. This Patty Pan Squash plant has been growing faster than the weeds and it’s in a container. The Assistant Gardener did not become a fan of it while I was away because it demands water almost every day. 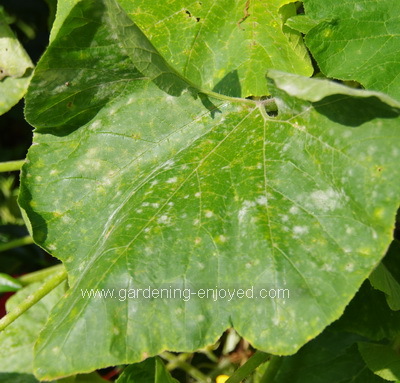 Unfortunately that time of year has come when the leaves get invaded by powdery mildew, a fungus disease that appears as fuzzy white spots on the leaves and the stems. My simple solution is a spray of water and milk using 1 part milk to 9 parts water. I have heard of more concentrated forms of this spray but this works fine for me. It stops the fungus growth in its tracks and allows the plant to keep on growing and producing its portion of the oversupply of summer squash that manages to show up every summer. I reapply the spray when I see the white spots start to expand again. Strangely the Tuberous Begonias have not shown any signs of mildew this year. When it does show up and I have no doubt that it will, then the same spray will be applied to save the Begonias. It’s sort of a Beauty and the Beast story and with the help of my milk spray I at least find myself almost winning.